You can’t turn around in India without running into some historical site or ancient temple or something. Early in our month in India we had to come to grips with the idea that there’s just no way we could see all the things on our wishlist in 30 days. We couldn’t even see half of it. That’s one reason we cut out all the southern part of the country. We also knew from experience that as we traveled, we would find things we want to visit that we’d never heard about before. Bharatpuhr was one of these. You can get from Agra to Jaipur, the second and third points of the Golden Triangle, in a single day of travel by train, bus, or automobile. But it’s a long day, and we don’t like long days on the road. Also, our host Anil in Agra told us about a bird sanctuary midway between the cities. The more I researched it, the better it sounded. 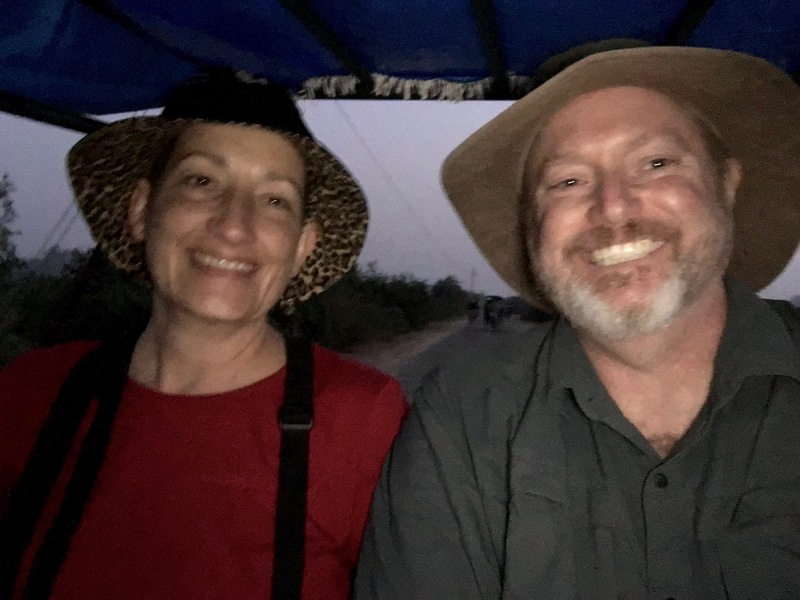 Beth’s an avid birder, in case you somehow didn’t know that, and this wildlife preserve in Bharatpuhr, nowadays called the Keoladeo National Park, sounded ideal. The 29 km2 (11 sq mi) reserve is locally known as Ghana, and is a mosaic of dry grasslands, woodlands, woodland swamps, and wetlands. These diverse habitats are home to 366 bird species, 379 floral species, 50 species of fish, 13 species of snakes, 5 species of lizards, 7 amphibian species,7 turtle species, and a variety of other invertebrates. Every year thousands of migratory waterfowl visit the park for wintering breeding etc. The Sanctuary is one of the richest bird areas in the world. It’s so significant that it is listed as a UNESCO World Heritage Site. So when I told Beth about all this, she agreed. We gotta go there! Normally, Bharatpuhr wouldn’t have any big draw for tourists, but people come from around the world to see the birds and other wildlife here. So there is a cluster of tourist hotels all along the highway just outside the entrance to the park. I found one of those that sounded good, called Hotel Sunbird. The room rate was more than our budget allows, but it was just going to be one night, and this place seemed too good to pass up. Hotel Sunbird, it turned out, was a great hotel and we had a very peaceful and relaxing time there. Here is my review on TripAdvisor, so I won’t bore you with more details. Instead of building the locks into the doors, sometimes in India they build hotels and homes to have a sliding bar on the door that you can lock with any padlock. 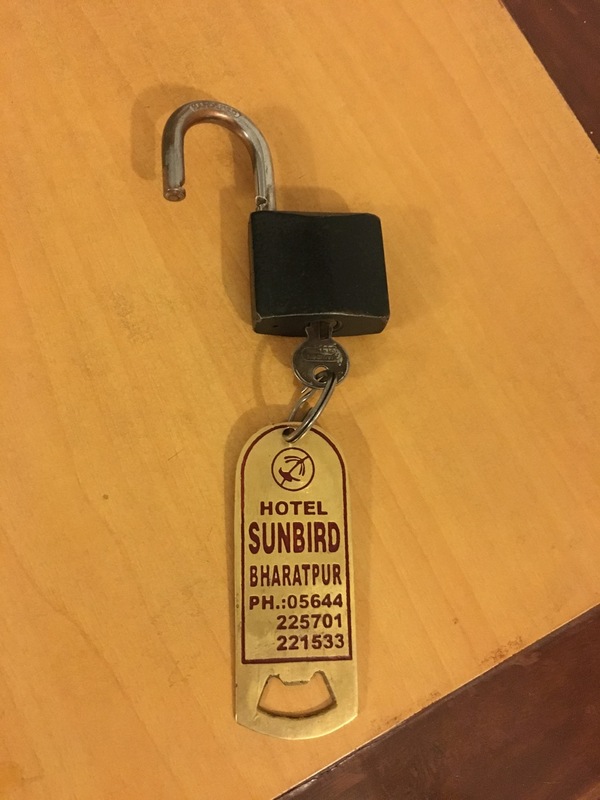 The homestay in Agra was that way, for instance, as was the Hotel Sunbird. We split the trip into two. One taxi driver from Agra drove us to the hotel in Bharatpuhr, and then the hotel where we planned to stay in Jaipur sent two (!!!) drivers to pick us up to take us the rest of the way the next day. That afternoon that we arrived, we hired a rickshaw puller, who doubles as a guide, to take us from the hotel to the national park and inside. But then we also hired a naturalist once we got inside. For the first half hour or so, we watched birds from the rickshaw. That was a bit awkward, because you can’t really watch birds in a moving vehicle. Beth would see something, call out “stop”, and then rickshaw driver would stop. Then she’d watch whatever it was through her binoculars for a while, then tell the guy to pedal some more. Another 50 meters down the road, we’d stop again. From observation, we could see that all the other tourists were just going straight down the road non-stop. They clearly weren’t serious birders, but just people who stopped by for a casual hour stay in the park. But after a while, we came to a foot trail and stopped. The naturalist, who had been riding alongside on his own mountain bike, said a few words to the rickshaw puller, and then we set out on foot. We spent the next couple hours on a trail that circled around a wetland area. We saw one other person the whole time, and she was a local person who either lived in the park or was in the park harvesting (legally or not, I don’t know) some wood. We also saw deer, antelope, jackals, cows, and a bat. But most of all, we saw tons of birds. Whenever Beth and I are traveling somewhere and we see a park bench under a tree, we stop to get a photo of ourselves there. 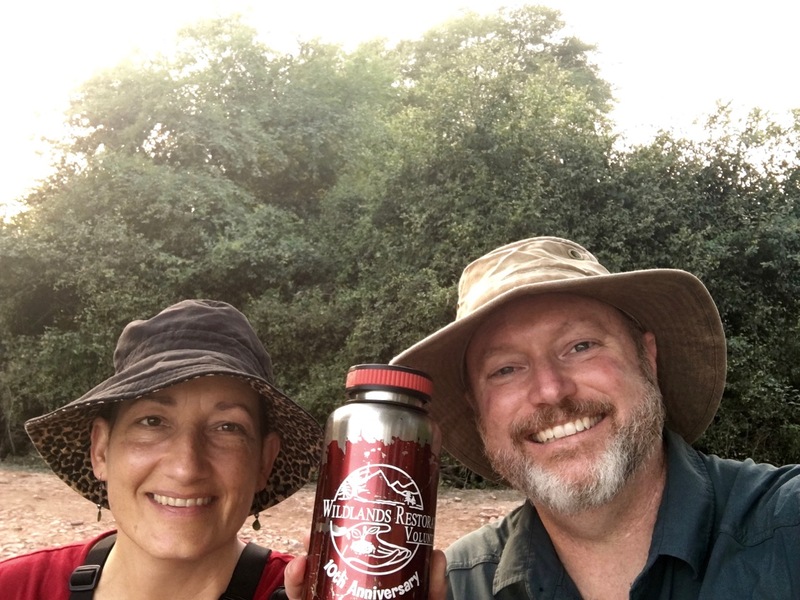 Also, I wanted my Wildlands Restoration Volunteer water bottle in the shot. This bottle has been everywhere. You can see it in photos of our Yellowstone trip several years back, for instance, where Beth used it as an improvised bell to scare off the local grizzly bear on a hike near Mammoth. The naturalist knew his stuff and even though I was borrowing his binoculars, he could identify birds far in the distance. Then Beth would see the bird, get its identifying characteristics, look in her field guide to confirm that she saw what the naturalist said we saw, and then scribble the name down in her notebook. And then I’d watch the bird a while through the naturalist’s binoculars and confirm the main points. This is how birding works. Normally when I go birding with Beth, we go through this routine three or four times over the course of a several hour session, because she’s already seen most of the birds in the areas we usually visit. But here in India, nearly every bird species was new to her. So she was scribbling species names into her book as fast as she could identify them. And then as soon as she finished writing one down, another new species would fly by. I can’t remember the exact number, but she got two or three dozen new species for her life list in that one evening, which is pretty good for a three hour birding trip. By the end, when the light started getting weak, my eyes got very tired and I developed bird fatigue. So I let the naturalist have his binoculars back, and I went back into “tag along” mode. When they would spot something new, I’d take a look. We got about 3/4 of the way around the walk when it became too dark to bird anymore, and so we just walked back to the main road. The end of the trail dumped us out into an area of a bunch of national park buildings, and our rickshaw puller was waiting there for us. He had moved both his rickshaw and the naturalist’s mountain bike two or three kilometers to this other area while we were off walking. We hopped in, and the guy pedaled us back to the entrance to the park, then to our hotel. Here’s a photo of Beth and me in the back of the rickshaw. It was a pretty fun evening, and something that just a week earlier we had no idea about. That’s why it’s good to not overplan your vacation. Interesting. 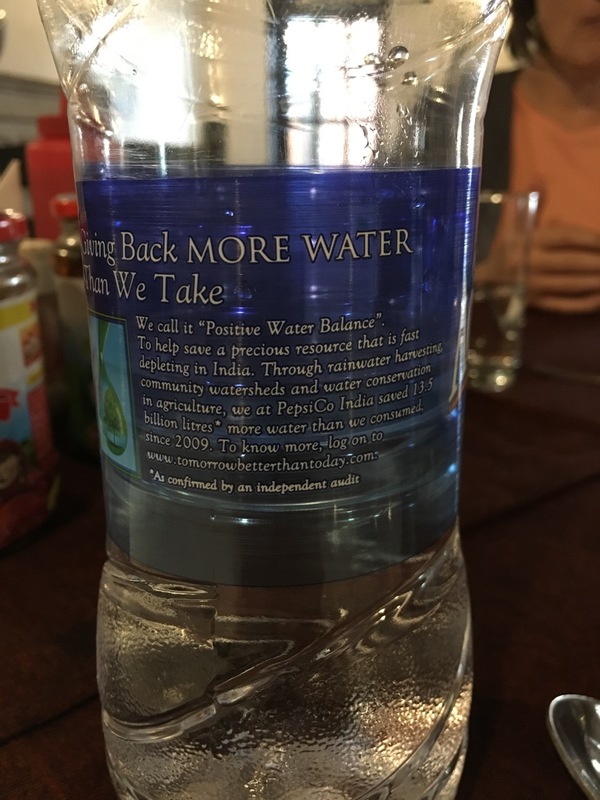 This water bottle from the hotel says this: Giving Back MORE WATER Than We Take. We call it “Positive Water Balance”. To help save a precious resource that is fast depleting in India. Through rainwater harvesting, community watersheds and water conservation in agriculture, we at PepsiCo India saved 13.5 billion litres more water than we consumed, since 2009. To know more, log on to www.tomorrowbetterthantoday.com.